This carefully selected blend of four different varieties is guaranteed to bring extra colour and taste to summer salads. 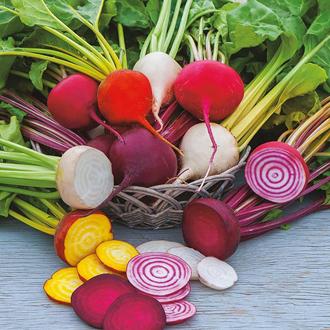 Remember too that beetroot is delicious served as a hot vegetable (we love it with a white sauce), while the foliage can be steamed and eaten as spinach. Multigerm variety. Sow outdoors Mid March-July, thinly, repeat at regular intervals for succession. Depth 2.5cm/1 in. Spacing In rows 30cm/12in apart. Thin out to 10cm/4in apart. Harvest June onwards. For winter use, lift in autumn and store away from frost in dry sand. Keep well watered and weed free.